Here’s a tough question for you. Do you think people really, truly trust you and your business? Why does this matter? Because trust is the most important facet of any business – so building trust should be the No.1 aim of every successful venture. Trust is about credibility, integrity, reliability – possibly even respect – solid character ethics and values that are not easily won or, for that matter, readily rubbed out. So how come trust barely registers a flicker in most management or marketing training? Maybe it seems too ethereal or hard to measure. But maybe, I’d argue, because building trust requires time and effort rather than instant quick win solutions. So that’s precisely why we’re focusing on image and reputation at the next three Business Media Club meetings at our clubs in Birmingham and Worcester. Image is having the right profile which seems a good fit for those we want to work with and for. Reputation is all about proactively building and promoting trust. Think about it. We buy goods and services from brands we recognise. We trust them to provide the services we want at the price we can afford. Trust isn’t always an expense-driven exclusive service – it is about recognition, reliability, quality and familiarity. But reputation spins both ways. You wouldn’t let someone with a poor reputation mind your children, tamper with your car or supply vital household utilities like gas, water or electricity. And how do we trust those we do? Because they come on trustworthy recommendation from friends or colleagues whose opinions we also value or through some other provable frame of reference. Being ‘a character’ and having ‘a reputation’ usually carries negative connotations. The world is full of empty vessels that make a lot of noise without the capability to back it up. Do you trust them? Trustworthiness comes from proof of skill, knowledge, experience and expertise. And trust can’t be bought, it has to be earned, promoted and indeed prioritised. I remember a business owner once telling me: “Everyone knows how good we are.” His company did indeed have skilled, experienced and trustworthy people on board. Trouble was, the business didn’t promote those values and were poor at telling their story in preference to shallow sales and marketing techniques – endless cold calling, long distance, unmeasured marketing and seeking to compete on price rather than value. In reality, relatively few people knew how good they were. So what’s the answer? Prioritise the building of trust and credibility by developing your own image and reputation plan. What might it consist of? Well, aside from, as Gandhi said, “Being the change you want to see in the world”, promoting your own solid values and ethics. There are any number of character marketing methods you can choose from blogs to testimonials, positive PR to talks, events, case studies and more. It is probably the most important plan you’ll ever devise. So why not give it time and thought? Do you mind if I ask one final question? What are you waiting for…? Image and reputation planning is the theme of April’s Business Media Club meetings at our Birmingham and Worcester clubs. 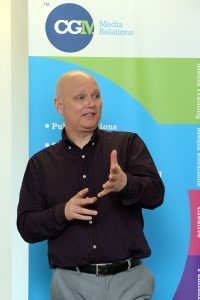 Chris Green is an award-winning author and broadcaster and managing partner of Chris Green Media – our aim is to inspire business people to communicate better.